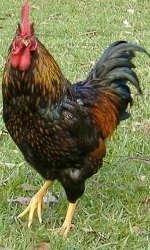 The Barnevelder chicken breed has a lovely shiny color to their plumage and lays coppery brown eggs. Size: Male: 7 Ibs. / Female: 6 Ibs. Comb, Wattles & Earlobes: They have a single comb with straight, upright, well-defined points. They have a medium size wattle and earlobes. They are all bright red in color. Color: They have a horn colored beak, reddish bay eyes, and yellow shanks and toes. Male: The head, neck, and back have black feathers laced with bronze. The saddle and breast have bronze feathers laced with a lustrous greenish black. Their tail is greenish black and the wings are black and bronze. The overall affect by the coloring is dark, but glistening. Female: The head and hackle are greenish black. The front of the neck, back, breast, and wings are primarily bronze with lacing of greenish black. The tail is black. The female seems to shimmer in the sunlight. Special Qualities: They have a lovely coloring and lay coppery brown eggs. This breed comes from the region of the Netherlands with the same name. This region has long been the poultry area of Holland. They developed the breed by crossing Asiatic breeds such as Brahma, Cochin, Langshan, and Maleier. The breeders were seeking to increase egg production of brown eggs, and to give the brown eggs a coppery tinge. There are four different varieties of this bird in the Netherlands, but only one of those is recognized by the APA. The one described here is rather showy with a unique iridescent sheen to it. The breed was first recognized by the APA in 1991.